By all accounts, 2016 could have been better, and I’m not even talking about the Presidential election or celebrity deaths. The year had just begun when St. Mark’s Bookshop, an East Village staple known for esoteric consignment zines, art books, and poetry, announced it would close for the second time. But that wasn’t the last New York City store to shutter in 2016. The Community Bookstore, a used store on Court Street, finally closed up after announcing its slow death a year earlier. The only bookstore in the Bronx, a Barnes & Noble, announced it was leaving the borough. P.S. Bookshop, a DUMBO outlet of used books, couldn’t pay rent in the now ultra hip tech center. Nor could DUMBO’s massive Powerhouse Arena, and the store relocated from the stadium-sized venue to a paltry little space below the elevated tracks of the Manhattan Bridge. Both of those DUMBO store fronts sat empty through the holiday season, and like many DUMBO storefronts, offered nothing but advertisements for retail space for rent. Perhaps, though, the greatest blow to the literary community was the sudden and somewhat unexpected closing of BookCourt. Authors and publicists planning spring launches were left scrambling for appropriate venues after the thirty-five-year-old store announced a closing. The buildings have been sold to a property developer. 2017 offers what the animated version of Carrie Fisher’s face declares at the end of Rogue One: hope. Greenlight Bookstore is officially opening a second location on Saturday, January 7th, 2017. The Prospect Lefferts Gardens store will be the second Greenlight store. 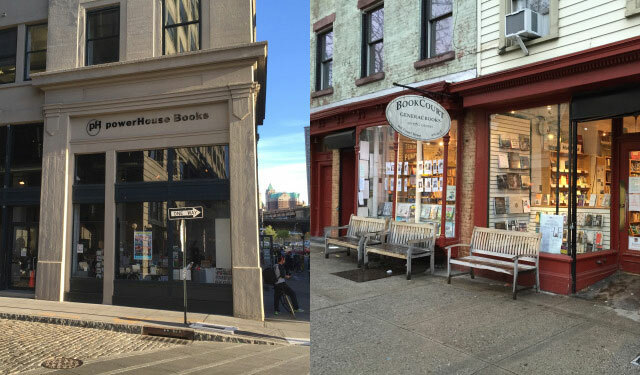 Brooklyn author Emma Straub has promised to restore a neighborhood bookshop to fill the hole left by BookCourt’s sudden departure this spring. And in the Bronx, one hometown woman hopes to open a combination wine bar and bookstore, which sounds way better than a combination Pizza Hut and Taco Bell. As the new year unfolds, English Kills Review will continue the work we have done. When new stores open, we will be there. When new reading series launch, we’ll have the details. When new books launch, we’ll write about them. Below is a summary of the events, interviews, and essays we published in 2016. We hope to publish even more in 2017.